Calligraphy and Pictures for the Fifty-three Stations - Terrific design from a Tokaido Road series pairing images with verses in calligraphy for the different stations. 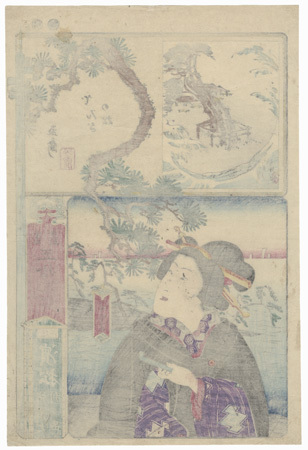 Different artists contributed designs, including Yoshitora and Kunisada II. 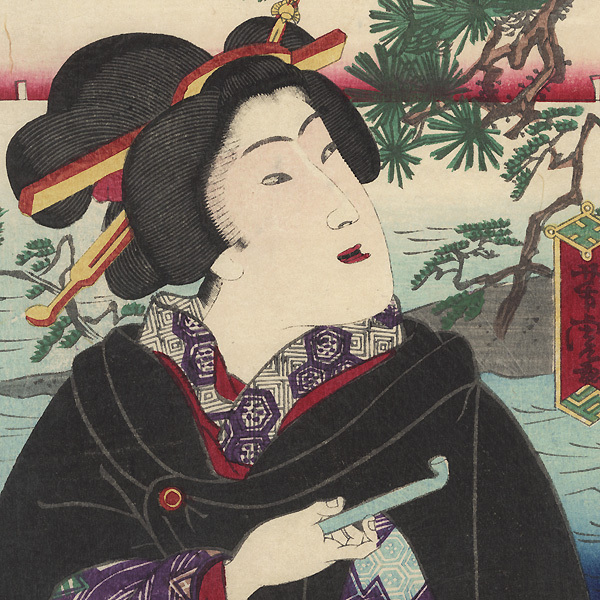 The large pictures include landscapes, figures from history and legend, and scenes from kabuki plays and folktales. Several prints feature comic illustrations, including the adventures and mishaps of Kita and Yaji, the bumbling travelers from the popular novel "Shank's Mare." Others include travelers in Western attire or distinctly modern Meiji subjects. These imaginative prints are beautifully detailed with attractive color and fine line work, and offer an interesting Meiji era take on the classic Tokaido subject. 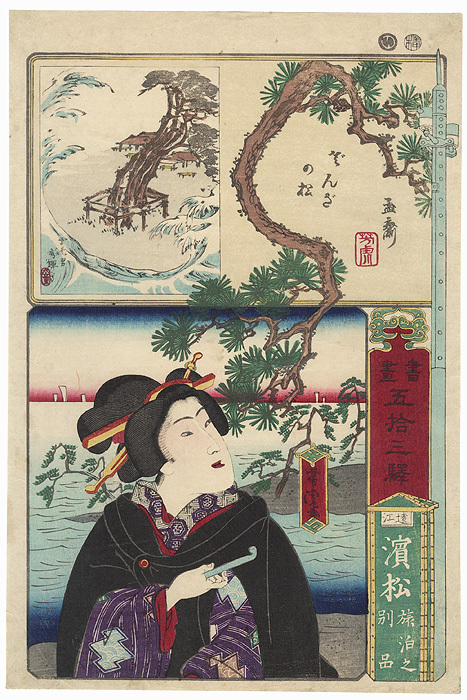 A great choice for collectors interested in life along the Tokaido Road. Hamamatsu in Totomi Province - Terrific scene of a beauty stopping along the shore at Hamamatsu, which means "pine beach." She smiles as she looks over her shoulder, holding a pipe in one hand. She wears a black coat over her purple striped kimono, her hair adorned with a few simple hairpins. A few pine trees dot the strip of sand behind her, and sails are visible on the horizon. The inset at top left shows a magnificent old pine tree on the shore, surrounded by a low wooden fence, the scene framed by the arc of a giant wave. A beautiful composition with the craggy pine branch at upper right hanging down into the scene below. The Boston Museum of Fine Arts has this image its collection. A very handsome design from this series. Condition - This print with excellent color and detail as shown. Slight toning, a few spots. Please see photos for details. Good overall.